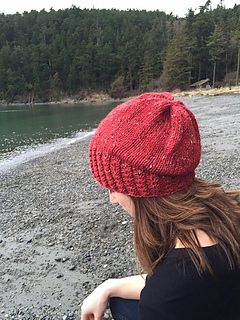 Twist and Slouch is a simple hat pattern with a stretchy brim designed to “hug” the wearers head and keep out the chilly Pacific Northwest winds of Winter… or spring…or summer… or fall (the weather can be unpredictable around here, and if you are on a boat in the Puget sound- it’s bound to be windy). Don’t be intimidated by the twisted rib technique, it is simple to do and creates a cable like effect. The pattern is written for an adult size, 20-23 inch head circumference. 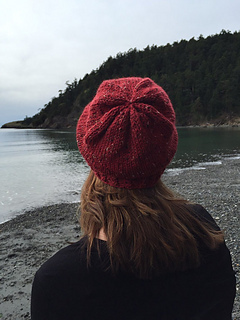 The depth or “slouchiness” of the hat can be easily manipulated by knitting more or less rounds before decreasing. 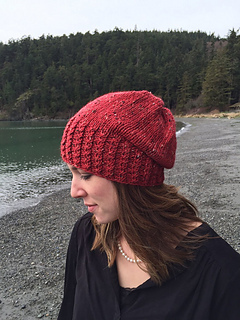 The crown has very little decreasing and is therefore a great option for the beginning knitter. This Pattern is written for circular knitting needles and calls for a worsted or heavy worsted/aran weight yarn.